que educta est de Adam. abstersa sunt. V. How great the Savior’s goodness is! As we begin this glorious Eastertide, this blog begins a journey through the extraordinary liturgical compositions of the newest, Symphonic Doctor of the Church, St. Hildegard of Bingen. Our forty days of fasting are fulfilled—let us now embark on fifty days of wondrous beauty! Most of Hildegard’s musical compositions date to the 1140’s or 1150’s, and most were likely written for specific feasts. A few, such as the “Symphony of Virgins” (“O dulcissime amator”, Symphonia 57), are also found in the final vision of Hildegard’s first visionary work, Scivias (III.13), which describes with sight and sound the choirs of the heavenly symphony, and may have been used in various semi-liturgical celebrations within her community. Later, they were gathered together into a collection, titled Symphonia armonie celestium revelationum (“Symphony of the Harmony of Celestial Revelations”), organized hierarchically by topic: first those addressing the Trinity, as seen in the relationships between Father and Son, Mother and Son (and thus here we find the Marian works), and the Holy Spirit; then descending, through the celestial hierarchy to patron saints (like St. Rupert and St. Disibod), virgins, widows, innocents, and the special devotion in the Rhineland to the early German martyrs, St. Ursula and her companions; and finally, the Church, the Mother of all saints still striving here on earth. As this blog makes its way through the collection this Eastertide, it will roughly follow this ordering as found in the critical edition of Barbara Newman. Today, the Feast of Our Lord’s Resurrection, we begin with the responsory for the Creator with which the Symphonia opens. (The responsory, one of several compositional forms Hildegard used, is a series of solo verses alternating with choral responses sung at the first office of the day, vigils [matins], in the monastic liturgy.) 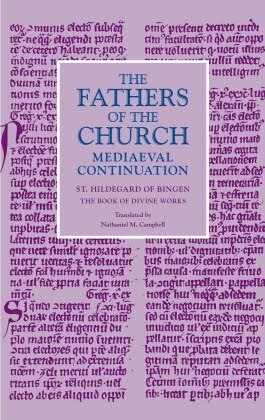 It rings with one of Hildegard’s most characteristic themes: the fulfillment of the “eternal counsel” (Ps. 32:11), that is, the predestined movement from creation through the Word to recreation by the Word-made-flesh. An often minority position in western Christianity, this doctrine of the eternal predestination of Christ holds that the Incarnation was a part of the divine counsel for creation from before all ages, rather than simply a “back-up plan” to fix the Fall. In this sense, the entire course of salvation history is the performance in time of the timeless celestial symphony, composed in eternity by the resounding Word of God. As a result, Hildegard rarely focuses on Christ’s death in her music—I offered a powerful exception, the antiphon “Cruor sanguinis”, on Friday—choosing instead to contemplate the Incarnation itself as the pivotal moment in which creation reached its perfect and predestined trajectory. The freedom, then, that we celebrate today is the cleansing of the garment of human flesh from suffering. In this responsory, Hildegard exploits the repetition of the respond (refrain) to elegantly move from thinking first about the cleansing of Adam’s flesh from suffering to the cleansing of Christ’s flesh by his own suffering. As Barbara Newman notes, this transposition also involves the shift from Eve (the “form of flesh from Adam born [lit. brought forth]”) to Mary, the human form in which Christ put on flesh; and the shift from the second-person address to God, “the strength within eternity”, to a third-person narration of redemption. 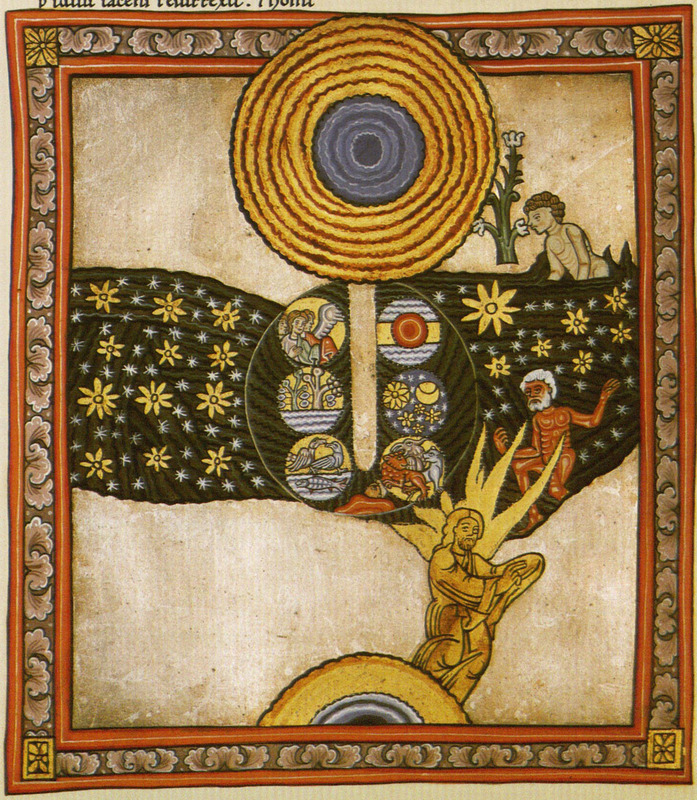 The mirrored movements of descent and ascent that characterize Hildegard’s neoplatonic conception of the relationship between divinity and creation can also be seen in the illustration she designed to accompany the vision that opens the second part of the Scivias in the Rupertsberg manuscript (fol. 41v from the facsimile, as shown above). 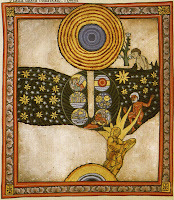 The top of the image swirls with concentric circles of blue and gold, while by contrast, a straight, vertical finger of silver pierces another circle below—the Trinity (Father in gold, Son in blue, Holy Spirit in silver), the “strength within eternity,” thrusts into time to create the world, as shown in the six roundels within the lower circle, each representing one of the days of creation in Genesis. Yet, the narratival move from eternity above to time below in the middle register is countered by the visual thrust of the golden Redeemer bursting up from the bottom register, causing the eye to move back up the page, from time back into eternity. This is the golden promise whose fulfillment we celebrate today: for God became like us, in order to call us back to him, that we might become like God. Let us rejoice! Christ is Risen! Alleluia!